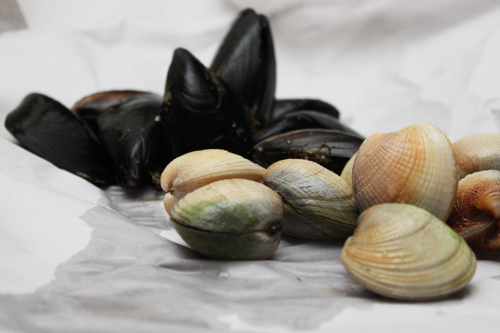 Which is fancy for fish, mussels and clams baked in paper. In my efforts to stop baking (well not stop, cut back, and when I mean baking, I mean cakes and sweets, cos then I would have already failed on this mission seeing I baked bread yesterday, and ate a lamington for breakfast, I’m not really sticking to this mission, seems I need to try harder, hrmm.. I’ve also got distracted) I turned my thoughts towards healthy but incredibly awesome food. I made this a couple of times when I lived at home with my parents. A couple of goes in, we started to perfect it. It comes from Jamie Oliver’s book, Jamie’s Kitchen. We adapted it to suit our palates, and gees its yum! So light and tasty. The lemon gives it a little zing, while the wine and butter create an amazing little broth when cooked with the water from the shellfish. Last night, Colin and I ate this with blanched asparagus, which we dipped into the broth, along with some fresh made sourdough. Great dinner! Bare with me on the details of how to create the bag part – I can picture it in my head while I write but I’m not the best at explaining things, so it might come across at confusing. So basically, what you want to do is place everything in the centre except the wine, half seal the bag, pour in the wine, then finish sealing it, remembering to turn the edges up so nothing seeps out. Got it? Yeah? Good. Enjoy! Preheat the oven to 250°C, with a roasting tray inside. The hot tray will ensure the fish is cooked quickly and evenly. Take 2 square pieces of tinfoil (the length of the roll should be the same as the width) and two pieces of baking paper. You can use one or the other; I prefer both to ensure liquid doesn’t seep from the bag. 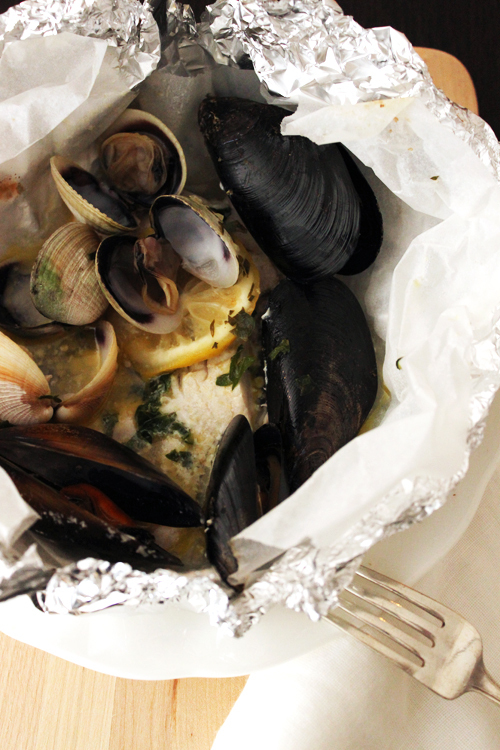 Place the baking paper on top of the foil, and place one piece of fish, 4 mussels and 4 clams in the centre of each. 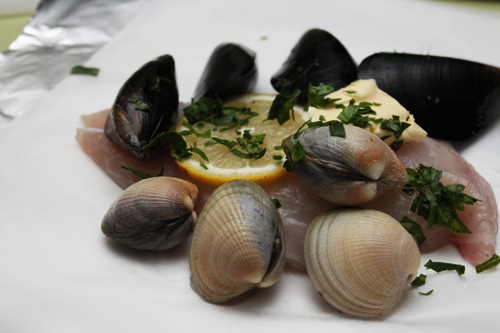 Place a slice of lemon on top of the fish, a knob of butter and sprinkling of parsley. Bring the two edges (longways) of the foil together and make a fold at the centre, pinching the foil to ensure no liquid or steam escapes. Bring one of the ends up slightly (also to ensure no liquid comes out) and scrunch the foil to seal the bag. Take ¼ cup of wine and pour into each bag from the open end, then carefully seal that end, lifting the corner up as you scrunch. Carefully remove the hot tray from the oven and place the sealed bags in the centre. You will hear a sizzle and steam may start – this is normal. Return the tray to the oven and cook for 15 – 20 minutes, depending on the thickness of the fish. You can test the fish after 15 minutes to see whether it is cooked through and the shellfish have opened up. Serve with some greens and crusty bread. I love anything seafood. And I've had a real hankerin' for something just like this... thanks for the share! Happy to share! :) This is one of my favourite ways to eat seafood as the dish is so light but the flavours are intense!